The CPOUT file format which requires the CP Link software. The NC500 format, no specific Link software is required in this case, just the NC500 compatibility. As well as XML post processors, OptiCut Pro PP comes with both CPOUT and NC500 post processors. With such a wide range of saws, it can sometimes be difficult to identify what system your saw uses. Biesse support can advise on this of course, but we’re happy to help if required. We can also provide sample output files from OptiCut in any or all of these formats for testing. Hi all, we recently had a query from a customer who wanted to check that OptiCut would work with their Biesse Selco CNC saw (in this case it was the Biesse Selco SK4 450). 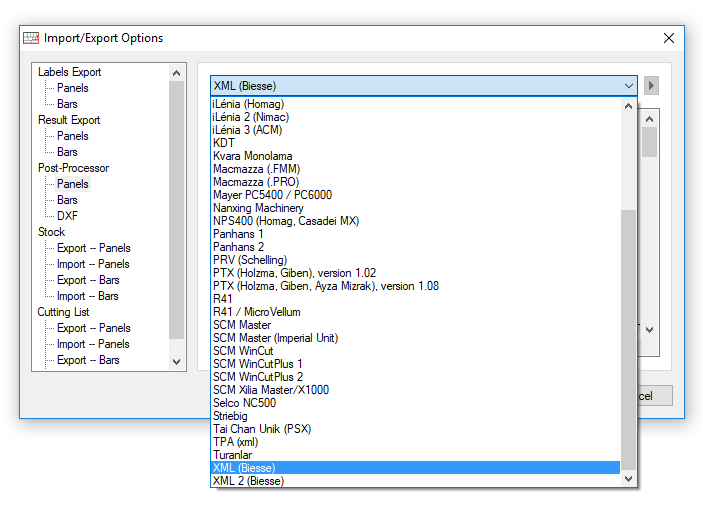 The key point to check is that your Selco saw has the XML interface, in which case OptiCut’s XML post processor will output the optimised cutting map files to run the saw, see below for a list of OptiCut’s post processors showing the XML option. All recent Selco saws are supplied with the XML interface. If you don’t have this interface, please discuss your saw’s CNC controller options with Biesse or contact us for more details. The difference between the two XML post processors shown is that the XML2 PP accommodates saws that handle more complex cutting patterns. We can send you sample output files for both for testing if required.